*2.99% for 60 month: Offers subject to credit approval. Offers may not be combined with any other offers, and is subject to change and may be extended or terminated without further notice. 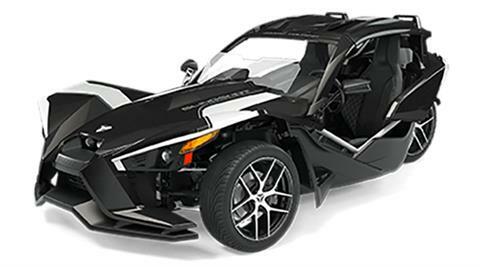 Offer valid on new 2015, 2016, and 2016.5 Polaris® Slingshot® models only. Terms up to 84 months available for purchases based on credit approval criteria. Fixed APR of 2.99%, 3.49%, and 3.99% will apply depending on term and credit. An example of monthly payments required on a 60-month term at 2.99% is $17.96 per $1,000 financed; and at 11.99% rate: $22.24. An example of monthly payments required on a 72-month term at 3.49% APR is $15.41 per $1,000 financed; and at 12.49% rate: $19.81. See participating retailers for complete offer details and conditions. Offer ends July 25, 2016. **Up to $1000 Customer Cash: Rebates vary by model valid on select new 2015 & 2016 models. Offers valid from June 1, 2016 – July 25, 2016. Slingshot is a three-wheeled motorcycle. It is not an automobile. It does not have air bags, and it does not meet automotive safety standards. Three-wheeled vehicles may handle differently than other vehicles, especially in wet conditions. Always wear helmets and fasten seat belts. Driver may need a valid motorcycle endorsement. Don’t drink and drive. ©2016 Polaris Industries Inc.